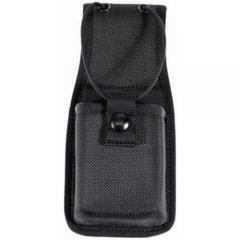 This radio case from Blackhawk provides convenient belt-mounted carry for a standard-sized Motorola radio. Its swivel belt loop allows you to detach it without taking your belt off. The pouch is made from durable molded Cordura nylon, making it protective and durable. The top of the case is open to allow the antenna to protrude, but it includes an elastic shock cord retention system that keeps the radio securely inside as you move. The cord attaches to a snap fastening, so you can detach it entirely to remove your radio from the pouch when needed.